Novack Café, is located in the back of the library and is often open at late hours. Being a low-income student at Dartmouth is not easy. It is often accompanied with working several hours a week on campus, hunting for online PDFs of textbooks and facing the uncomfortable prospect of saying no to your friends when asked to eat out or travel abroad for spring break. While Dartmouth has come a long way from being an institution that catered to white wealthy males, there is still a stigma low-income students face on campus. The College’s socioeconomic divide remains one of the highest amongst its peer institutions. This January, The New York Times Upshot conducted a study of student income levels and socioeconomic status at colleges across America and found that elite colleges are very economically segregated. Dartmouth was one of the 38 colleges in the nation with more students represented from the top one percent income percentile than the bottom 60 percent. The study found that 21 percent of Dartmouth students come from the top one percent, which was the 16th highest percentage out of the colleges analyzed and the highest among the Ivy League. Moreover, 69 percent of Dartmouth students come from the top 20 percent while 2.6 percent come from the bottom 20 percent. The median family income of Dartmouth students is $200,400. On top of these statistics, low-income students also have to navigate a variety of financial and non-financial challenges on campus. Juan Iscoa ’20 said that he was shocked by the amount of privilege at Dartmouth, demonstrated by students openly discussing spending copious amounts of money. Iscoa described his financial background as lower middle class and said that he has had to sleep on a floor and go hungry for extended periods of time in his life. He added that at Dartmouth, he has had to say no multiple times to friends to go out and eat because much of the food in Hanover is expensive. Iscoa added that he has occasionally felt out of place because other students have had the privilege of attending prestigious boarding schools and conferences that have prepared them for the rigor of Dartmouth. Andrew Sosanya ’20 said he learned about Dartmouth through QuestBridge, a national non-profit focused on connecting low-income students with top colleges through programs like the National College Match and the College Prep Scholarship. He matched with the College through the QuestBridge National College Match, granting him a full scholarship. Sosanya said that he doesn’t think socioeconomic status is largely visible on campus and believes it is not a big part of most students’ identities on campus. “Unless you show it off, socioeconomic status really isn’t a big part of your identity at all ... generally for me, it isn’t a big part of my identity and I can make friends with people from all kinds of income brackets,” Sosanya said. Lucia Caballero ’19 agreed with Sosanya, saying that socioeconomic status is something that you can conceal and that the socioeconomic disparities on campus aren’t necessarily highly visible. However, she added that as an incoming freshman, she did not expect the socioeconomic divide to be as wide as it is, finding the student population to be much more privileged than she originally thought. Caballero said that socioeconomic status can manifest itself in subtle ways on campus such as when she isn’t invited to eat out by her friends because they know she can’t afford it or when other students will refrain from talking about spending money around her. One reality for many students in Dartmouth’s low-income community is the need to work a job, or multiple jobs, in order to support themselves and occasionally send money back home. Caballero recently conducted a study, entitled “The Racial Divisions of Labor at Dartmouth: a Novack Case Study,” for Geography 28, “Immigration, Race and Ethnicity.” According to the research, the majority of student employees at Novak Cafe, a subdivision of Dartmouth Dining Services, are minorities and from low-income backgrounds. Her study interviewed 10 participants: 7 Latino, 1 Black, 1 White, 1 Asian; 8 women and 2 men. Caballero said that all of the students surveyed said that they knew they would have to work on campus to support themselves. The study found that 90 percent of the students who work at Novack are minorities and from low-income backgrounds. All but one of the students interviewed said that they work multiple jobs in addition to working at Novack and all of the participants said that they were financially dependent on their jobs there. She said that many students work at Novack out of financial necessity, citing the fact that DDS jobs are typically the highest-paying work-study jobs. She added that Novack employees are comprised of a very strong minority community, where freshmen who are minorities work there after hearing about the position from minority upperclassmen. Caballero said that being a minority and being low-income go hand-in-hand and that working at Novack identifies students as low-income. Novack employees tend to be affiliated with communities such as the First-Year Student Enrichment program and the Latinx community, which is how they end up forming a space for low-income minorities through working at Novack, she added. Barbara Olachea ’19 said she got her first job at Novack through FYSEP upperclassmen and that getting a job was very important for her financial security. She added that she had to get multiple other jobs. “As a freshman I didn’t have money saved up and so that money that I made was really crucial in my transitioning for the first couple of months to Dartmouth,” Olachea said. She added that Novack has given her a network of people to study with and is a space that is has helped students of color come to terms with being a low-income student at Dartmouth. Caballero said that many students often minimize the interactions they have with Novack employees because of the socioeconomic gap between them. She said students often make assumptions because Novack employees are mostly from low-income backgrounds and sometimes treat them rudely. Novack is just one example of the many spaces in which low-income students at Dartmouth find community. Programs such as FYSEP, directed at first generation students, and Dartmouth Quest for Socioeconomic Engagement and Dartmouth’s QuestBridge Chapter, help low-income students to transition into Dartmouth and find common bonds with those from similar backgrounds. Even though low-income and minority students have often overcome tremendous adversity to get to Dartmouth, they often find it helpful in navigating certain situations and helping other students from similar backgrounds. Olachea said that being a low-income student plays a big part in her Dartmouth experience but that she has been able to use her experience as a point of reference, helping other students with similar backgrounds as they transition to college life. She said that although Dartmouth isn’t perfectly suited for minorities, she found a support network through other low-income and minority students. “Organizations like FYSEP really reaffirm that you might have certain obstacles but you deserve to be here as much as anybody else even though you might not be a legacy or you might not be able to afford the same coat that your classmates can,” Olachea said. She said that the College has done a good job at making sure that events on campus cater to different identities and communication between administration and low-income groups on campus. However, she added that it follows the trend of mimicking other institutions rather than taking the initiative to listen to low-income students then taking a stance on what they are going to do for them. 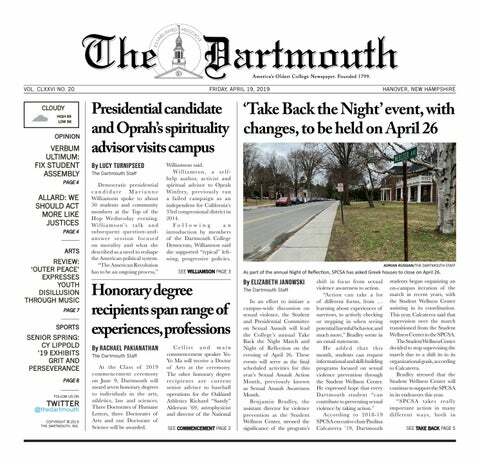 “It is easy to feel lost at Dartmouth as a lot of students don’t come from low-income backgrounds or face the struggles these students face,” Olachea said. Sosanya said that he has often sent money back to his parents but that, as a QuestBridge match, he has most things covered for him and knows that there is more financial assistance options available to him as a low-income student. He said that while he can mesh with people from different income brackets, he related more to people through FYSEP, first-generation college students and people of color. Sosanya said looking back on freshman year he only made friends with students of color or Caucasian people who actively made the effort to diversify their interactions on campus. He was closer to others with same experiences as him, socioeconomically and racially. Although Dartmouth remains a largely privileged campus, it presents an opportunity for low-income students to change their socioeconomic status and rise above poverty levels. In the same New York Times piece referenced earlier, Dartmouth ranked 100th in the likelihood that a student has to move from the bottom fifth income bracket to the top fifth. According to the study, low-income students at Dartmouth have a 50 percent chance of making an income in the top fifth of income percentiles. Iscoa echoed the above sentiment, saying that compared to decades ago, Dartmouth has transformed itself to be more diverse and the student body looks completely different today. However, he acknowledged that in order to truly be diverse, Dartmouth has to better acknowledge racial and socioeconomic differences by accepting more students from lower-income backgrounds. The author is a Questbridge Scholar and a member of Dartmouth Quest for Socioeconomic Engagement. Sosanya is a staff writer for The Dartmouth.